John Baptist Vianney (Curé d'Ars), Priest (RM), Devotee of Saint Philomena. 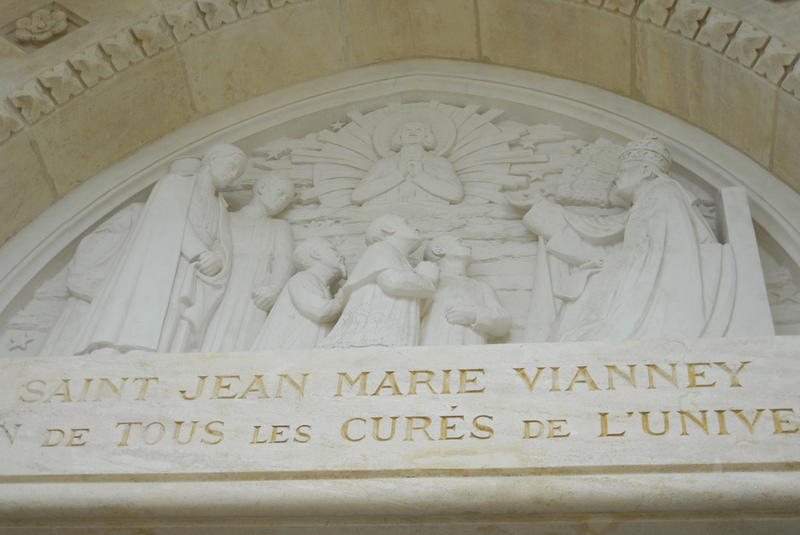 On her return to France from Mugnano, Pauline Jaricot went to visit her dear friend, the Venerable Curé of Ars, to whom she recounted the whole history of her miraculous cure. Mdlle. Jaricot bestowed upon the Curé a portion of the relics she had obtained from Mugnano, uttering these prophetic words; "Have full confidence in this great Saint, she will obtain for you all that you ask." The holy priest whilst listening to her with rapt attention felt a burning love for the Little Saint kindle in his heart. Intense was his joy when Pauline offered him a part of the precious relics which she had brought with her. A chapel was immediately erected in his church in honour of the Virgin Martyr where the relic was duly placed. This chapel soon became the scene of innumerable cures, conversions and miracles. M. Vianney dedicated himself by special vow to Saint Philomena, and a marvelous intimacy became evident between the good priest and her whom he now considered his Celestial Patroness. He did everything for her and she did everything for him. She appeared to him, conversed with him and granted everything in answer to his prayers. He called her by the tenderest names and she delighted in bestowing on him the most wonderful favors. His gift of miracles was extraordinary, yet, far from producing in him the slightest notion of vanity, it was the greatest cross he had to bear. He was wont to throw all the blame on Saint Philomena. 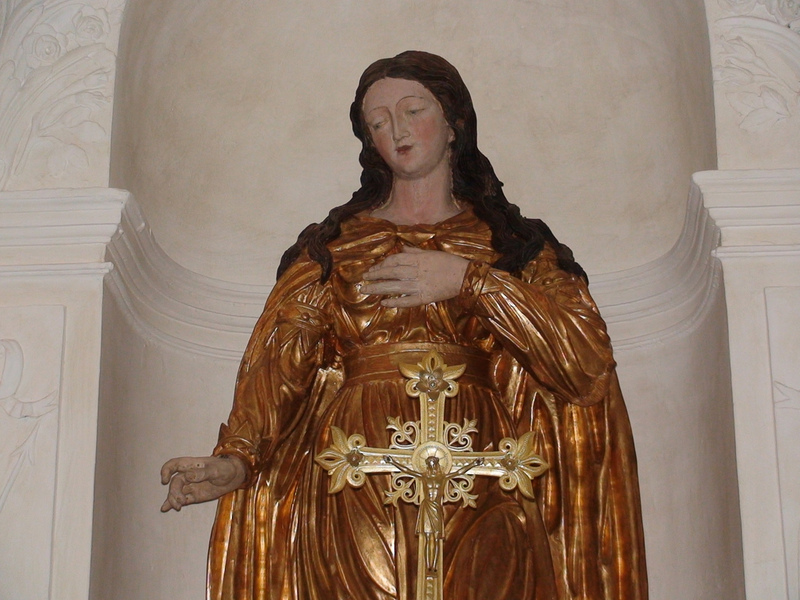 "It’s Saint Philomena. I wish she would work her miracles away from here" he would say with a laugh. But all the same the Little Saint seemed to take keen pleasure in teasing her holy friend by performing her wonders by his very hands. On one occasion a poor woman in the midst of a crowded church besought him to bless her sick child. The venerable Curé could not resist the supplications of the poor mother. He blessed the child and it was instantly restored to health. "Oh! Oh!" said the holy man, full of confusion, making off in haste to the sacristy: "I wish Saint Philomena would have cured the child at home." In season and out of season he spoke of his "dear Little Saint." In a short time all France rang with her name. 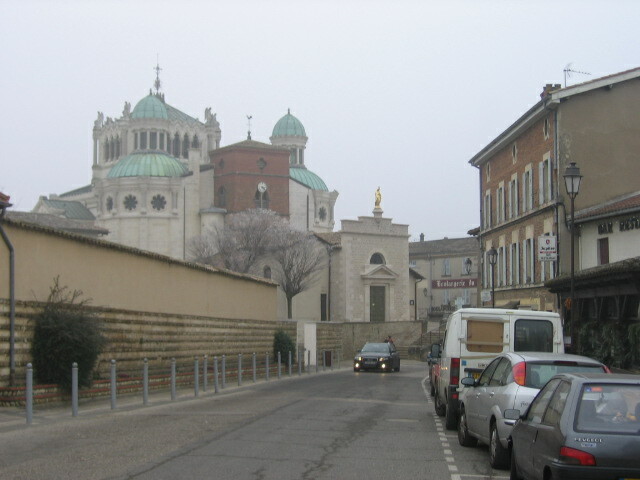 Every diocese has altars and chapels and churches dedicated to the Thaumaturga. In Langres alone there were no less than twelve churches consecrated to her honour. Her three feasts the 11th, August, her principal festival, the 25th. May the Finding of her Relics and the Sunday within the octave of the Ascension, the feast of her Patronage, began to be celebrated with great pomp and attracted immense crowds. 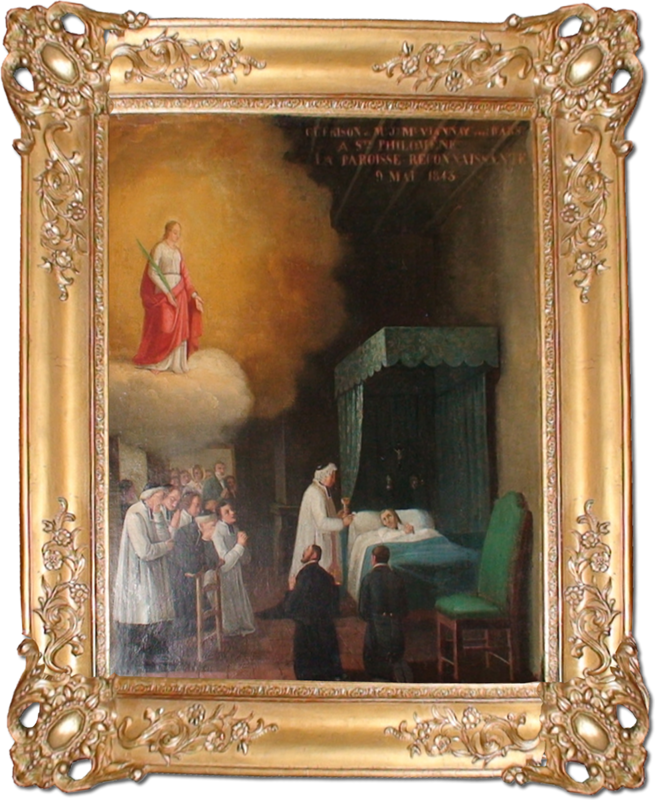 The Painting that depicts Saint Philomena appearing to Saint John Vianney. 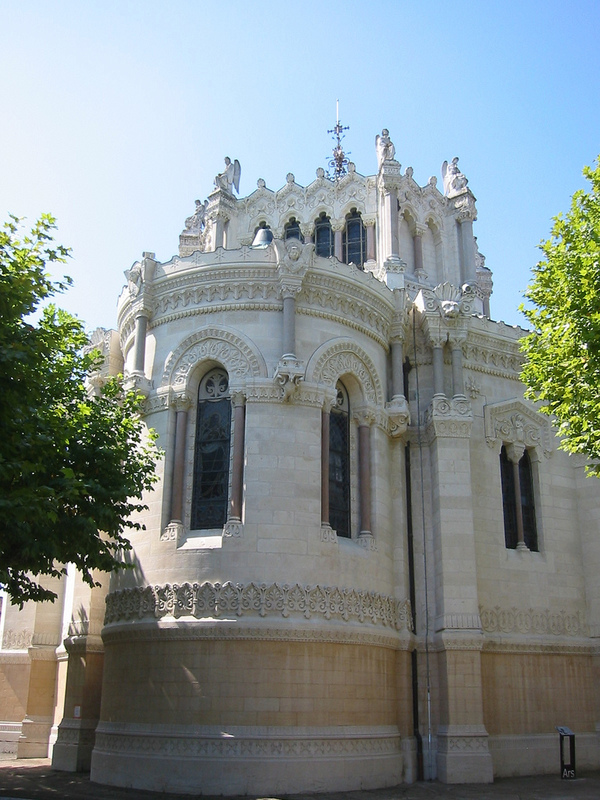 The painting is housed in the Shrine of Ars, France. Of the many marvels to be seen at Ars during the life of its saintly pastor, none was greater than the daily life of the holy man himself. His frail body was too extenuated with such rigorous fasts and penitential exercises that his emaciated appearance struck the visitors to Ars with awe. Notwithstanding his extreme weakness, the incessant labor which he took on himself each day were enough to exhaust the most herculean strength, were he endowed with it. Day followed day and crowds thronged to Ars not only from all parts of France, but from England, Ireland, Germany and the other countries of Europe. The sick, the sorrowful, holy souls as well as the most abandoned sinners flocked round him besieging his confessional. They spent long hours, even days, awaiting their turn to poor out their sorrows into his loving heart, or to ask for the solution of some subtle difficulty, or to tell him of the sins and wickedness of a life-time. One glance from him went straight to the heart of the most hardened reprobate. His angelic smile brought comfort to the most distressed. A word - seemingly inspired - resolved the most intricate doubt. But how he lived! That was the miracle of Ars. The whole parish was in tears. "You cannot form any idea," wrote Mme. La Comtesse des Garets, in a letter dated May the 10th, 1843, "of the touching and pious spectacle, that has been before our eyes ever since the beginning of the saintly man’s illness. One sees nothing but tears hears nothing but prayers and sobs. The church, which seems desolate without him, is nevertheless continually filled with weeping crowds, imploring Heaven with heart and should, by prayers, and acts of naïve faith, and touching piety. …Candles are burning on every altar, rosaries are in every hand. During the first few days guardians were obliged to be placed at the presbytery door, to keep back the eager crowd that besieged it, entreating to see the venerable Curé once more, and receive his last benediction. They could only calm his fervor, by giving notice each time the saint, rising in his bed of suffering, would give a general benediction." M. Vianney’s Confessor was of opinion that the last Sacraments ought to be administered. As the doctors had recommended hat he should be spared all strong emotion, the priests who were present at Ars, agreed that the bell should not be rung. The Curé overheard their conversation, and turning to the person at his bedside said: "Go, and have the bells rung; ought not the parishioners to pray for their Curé?" At the first deep tones of the bell the houses were deserted as if by magic, and the whole of the parish accompanied the Viaticum to the threshold of the presbytery. The priests, Count Prosper des Garets, entered the sick-chamber, whilst the crowd knelt in the court-yard of the house, and in the village square, weeping and praying. When M. Vianney was asked if he believed all the truths of religion, he answered: "I have never doubted one"; if he pardoned his enemies: "Thanks be to God, I have never wished evil to any one." The next morning the doctor approaching the sick man felt his pulse, and then, believing him to be past hearing, said aloud," He has only a few minutes to live." Four months later he himself described the anguish of this tragic moment to his family, when he was once more at Dardilly, in their midst. "Be sure, cousin, "he said to Mme. Fayolle of Ecully, "When you assist the dying by fortifying and preparing them to appear before God, that you never cease your exhortations until they have actually departed. For this is what happened a little while ago to me, whom all gave up for dead, and abandoned, without so much as word of comfort, because they were so certain that my last hour had come. I was in mortal dread of the Judgment of God when the doctor, after feeling my pulse, said, "He has only a few minutes more to live." ON hearing those words I thought, "In a few minutes thou wilt appear before God: and - with empty hands." Then, at the remembrance of the many persons, who had come from so far off to make their confessions, and who were imploring the Holy Virgin and Saint Philomena for me with all their hearts, I said within myself: "Lord! If thou canst still use me do not yet take me from this world." And even as I spoke, I felt my vigor renewed; and all my strength returned." At the exact moment that M. Vianney was so miraculous restored to life; a Mass was being said on his behalf at the altar of Saint Philomena. Pertinent, the parish school master - who never left the sick man night of day - was at this bed-side, and distinctly saw reflected on his face the emotions - to him inexplicable - of the drama which was being enacted in his soul. In his deposition, in the process of Beatification, he relates, "Before the priest had begun to offer the Holy Sacrifice, M. Vianney’s attitude appeared to me to be that of a person in mortal terror. I noticed something extraordinary in him, great anxiety, and unusual perturbation. I observed all his movements with redoubled attention, thinking that fatal hour had come, and that he was about to breathe his last. But as soon as the priest was at the Altar he suddenly became tranquil. It was as if he saw something pleasant and reassuring; and the Mass was scarcely over when he exclaimed, ‘My friend,! a great change has just been wrought in me….I am cured.’"
A distinguished savant from Lyons, M. Massait, set out on a scientific exploration in the French mountains. One of his fellow travelers, an old friend, who was going to Ars said to him: "Come to Ars and I will show you a Curé who works miracles." "Miracles, my friend. "He said laughing, "I don’t believe in miracles." "Well come and I promise that you will se and believe." "If you could make me believe, that would indeed be a miracle. But as Ars is not far from the scene of my explorations, I don’t mind if I do go." The rest of the story we shall leave M. Massait to tell in his own words. "Arrived in Ars, my friend put me up at the house of the Widow Gaillard, where we both shared the same room. Early in the morning he called out to me: "Massiat, will you do me a favor? Will you come to Mass with me?" "Go to Mass? Why, man" I answered, "I never went to Mass since my First Communion. Ask me something else". "You’ll come, old friend, just to do me a favor. It is there you can see and judge the Curé for yourself. I only ask you to use your eyes. I will get you a place where you can be at your ease." "Well, frankly it’s not much to my liking" I replied, "but I will go simply to please you." We got to the church. My friend put me in the seat facing the sacristy. Shortly afterwards the door opened and the Curé, vested for Mass, made his appearance. His eyes met mine for one instant, but the glance went right to my heart. I felt myself crushed beneath his glare. I bent my head and covered my face with my hands. All during the Mass I was immovable. When it ended I attempted to lift my head and got up to leave the church. Just as I passed the sacristy door I heard the words; "Get out all of you, all out" and a long bony hand rested on my arm and I felt myself drawn irresistibly into the sacristy as by an invisible force. The door closed on me. I felt myself attain beneath that gaze that seemed to crush me. I blurted out a few confused words: "Reverend Father I have a burden on my shoulders that weighs me down." Then I heard what seemed an angelic voice, such a one as I had never heard before, so sweet that it did not seem to proceed from mortal man. "You must get rid of the burden at once. Go on your knees; tell me your poor life. Our Lord will take the burden, my friend." Then I commenced my confession, it was the story of all my life since my First Communion, Little by little I felt relieved, then consoled and finally completely at rest. When I had finished, the saintly priest added: "Come back tomorrow but now you will go to the altar of Saint Philomena and tell her to ask of God your conversion." I did not weep in the sacristy but I confess that I wept abundantly at the altar of Saint Philomena." "Though reared by a Catholic mother I soon became dissolute young vagabond and, after a short absence from home, contracted scandalous vices. M father paid little or no attention to my conduct but my behavior well-nigh broke my mother’s heart. Taking offence at a few words of correction, I resolved to become a soldier where I foresaw that I could thus better enjoy my liberty. Before joining my regiment my mother begged me with tears in her eyes, as a last proof of love, to go with her to Ars. I laughed outright in her face and scoffed at the idea of going to confession. She begged me at least to go to Ars, even if I did not confess. Her tears and supplications overcame me and I consented to go, thought in anything but a pleasant frame of mind. But again temptation awaited me, for, on my arrival, I met two of my companions who sneered at the idea of the Curé’s influence. For no other reason than to please my mother I went to the church where M. Vianney was teaching catechism to the children. His appearance struck me forcibly and as his eyes met mine they seemed to see into the depths of my soul. I began to believe what I had heard already, that the Curé saw what passed in the consciences of those who approached him. Yet so frail is hi8man nature that on meeting my friends after the lesson, my companions and I enjoyed ourselves making jokes at the expense of the venerable priest. Once more my mother induced me to go to Church but I was scarcely there than I wished to leave. What was my amazement when at the precise moment the door of the sacristy opened and the Curé came straight towards me, making a sign to follow him, which I did without knowing what I was about! I fell on my knees and I wept. Seeing me moved, the holy priest bade me go to the altar of Saint Philomena and say 5 Our Fathers and Hail Martyrs. I went. It was the hour of grace. Something strange happened to me which I cannot explain. My heart began to beat with such violence that I was thoroughly frightened. I did not know how long I remained there. I lost all idea of time. What I do know is that, in getting up, I was no longer the same man. Tears choked me. I had to go out and breathe in the open air. My two friends, on seeing me exclaimed: "Oh, how you are changed! You have all the appearance of being converted." "Perhaps so," I replied, and turned brusquely on my heels. Though they made most deliberate and wicked attempts to prevent me, thank God I was proof against all temptation and have now been enjoying the bliss of religious life for sixteen years." In reply to some one who repeatedly asked him to Curé a friend, he replied: "No, no, Saint Philomena cured her once. She did not make proper use of it. It’s not likely that the little Saint will do it again." If, however he did not obtain her Curé he obtained for the poor invalid abundant graces, patience, strength and divine consolations. To a religious who was sent by his superior to solicit the Curé of a member of his order whose death would be a great loss to his Community, M. Vianney replied: "No, no. He is doing much more for his salvation and for his order as he is. He will not be cured." Born at Dardilly (near Lyons), France, on May 8, 1786; died at Ars, August 4, 1869; venerated on 26 July, 1896 by Pope Leo XIII; beatified on 8 January, 1905 by Pope Saint Pius X; canonized on 31 May, 1925 by Pope Pius XI; in 1929, he was declared the principal patron of parish priests. "We cannot comprehend the power that a pure soul has over God. It is not the soul that does God's will, but God who does the soul's will." -- Saint John Vianney. Over the front entrance of the Shrine of Ars, France. Without his iron-will, it is very unlikely that John Baptist Vianney would have been ordained. He was the son of a small farmer near Lyons and raised during the French Revolution and its aftermath. He had to take his First Communion in secret when he was 13, because the Church was still being persecuted. By the time this shepherd on his father Matthew's farm reached age 18 and decided that he was being called to the priesthood, open worship was again permitted. Unfortunately, John's father could not afford to send him to school for the proper education. While he was resting at the approach to the mountains of Le Forez, a stranger suddenly appeared, picked up his knapsack, and ordered him to follow. He found himself in a hut near the remote mountain village of Les Noës. The stranger was a deserter from the army, one of many hiding in the woods and hills of the area. 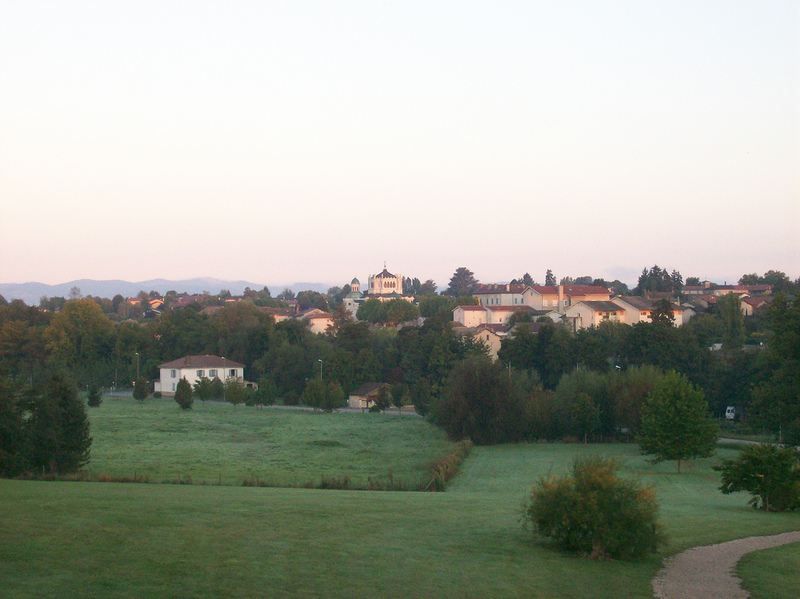 Vianney saw that the situation was compromising, and reported himself to the mayor of the commune. Monsieur Fayot was both humane and sensible; he pointed out to John that he technically was already a deserter, and that of two evils the lesser was to remain in refuge where he was. The mayor found Vianney a place in his own cousin's home, where John remained in hiding in a stable for 14 months. Several times he was nearly found by the gendarmes, once even feeling the point of a sword between his ribs as it was thrust about in the hay. He was able to return home when Napoleon granted amnesty to all deserters in 1810 on the occasion of his marriage to the Archduchess Marie-Louise. The following year he was tonsured, then spent a year studying philosophy at the minor seminary at Verrières. In 1813, John entered the major seminary at Lyons. He never did master Latin; thus, it he was called "the most unlearned but the most devout seminarian in Lyons." In fact, his scholarship was so bad that he dropped out after the first term, was privately tutored by Abbé Balley, and then failed the seminary examinations. In spite of that, his reputation for goodness and holiness was so strong that the vicar general allowed him to take minor orders on July 2, 1814, and to be ordained to the priesthood the following year, saying, "The Church wants not only learned priests but, even more, holy ones." He spent the next years as curate to Abbé Balley at Ecully until his mentor died in 1817. 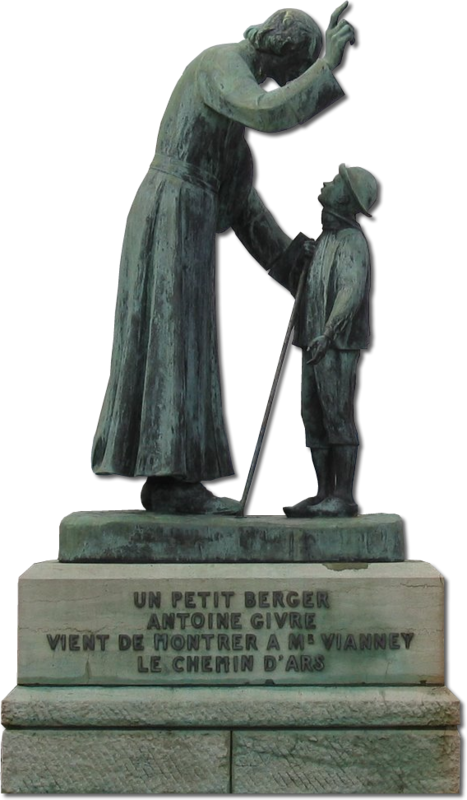 Early in 1818 he was appointed as the parish priest of the tiny village of Ars-en-Dombes (population: 230). He stayed there until he died 41 years later, and his effect was extraordinary. Ten years of patience, good example, and the mysterious outpouring of Divine grace transformed Ars from apathy into a village thriving with Christian spirit. He began personally visiting every household under his care and provided a regular catechism class for children. More important were his offering of a personal example of purity and fervor and his boldly attack on the widespread evils of drunkenness, profanity, immodesty, and slackness in attending Mass and otherwise observing the Sabbath. He had no fear of uttering from the pulpit words and expressions that offended God in order to ensure there was no misunderstanding as to what he was denouncing. He was constantly aware of his responsibility for the souls of his parishioners and gradually there was conversion because his severity in the pulpit was matched by his extraordinary insight and power of conversion in the confessional. His flock would say, "Our pastor is a saint and we must obey him." 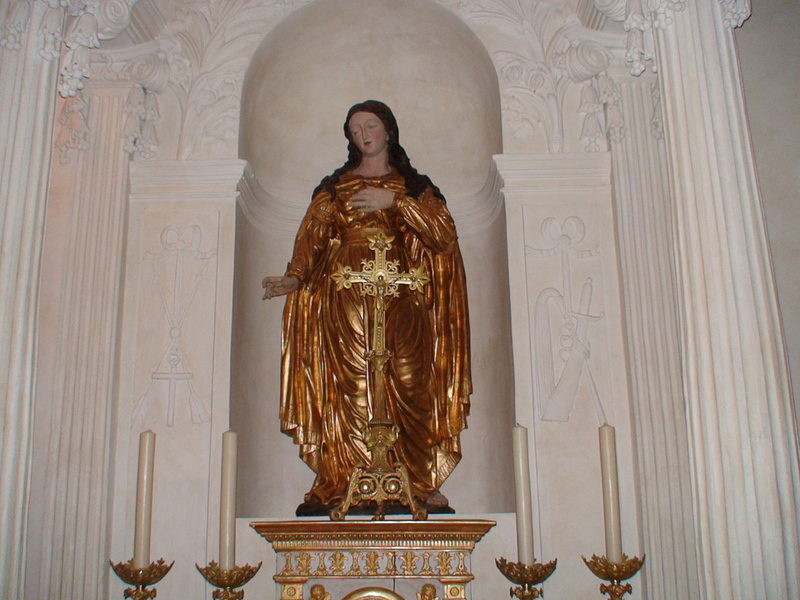 And soon the humble Curé d'Ars, whose reputation for holiness was augmented by reports of these miracles, was attracting penitents from all parts of Europe. 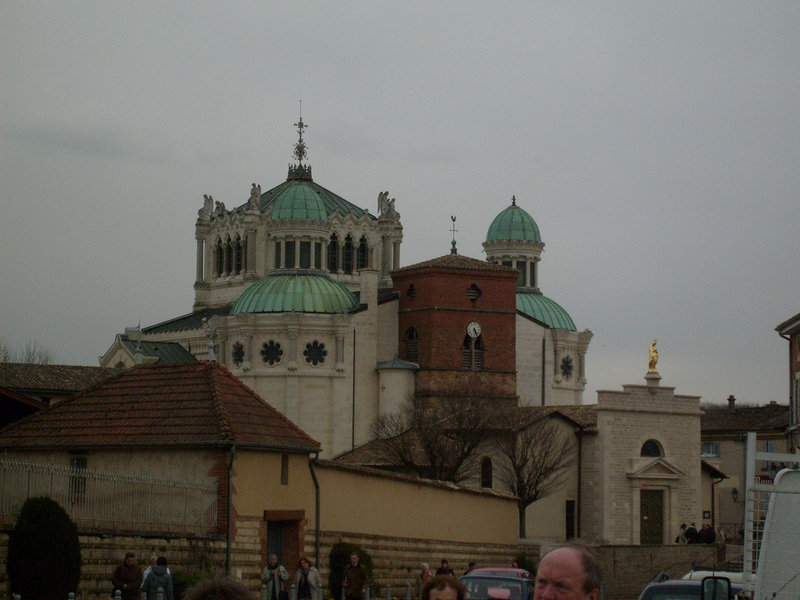 A shrine he built to Saint Philomena became a place of pilgrimage. So great was his insight into people's problems that by 1855 the number of his visitors was said to be 20,000 annually, and a special railroad booking office had to be opened in Lyons. Of course, Vianney's success prompted jealousy among some of his brother priests, who accused him of being over-zealous, ignorant, a charlatan, and mentally deranged and began spreading slanderous lies about him. These proved to be without foundation, and their bishop, Monsignor Devie, answered them, "I wish, gentlemen, that all my clergy had a touch of the same madness." Countless people testified that Vianney was gifted with a remarkable ability to read souls, discernment of spirits, and prophecy. The instructions that he gave were often short but they had all the power and insight of his saintliness. His utter simplicity moved many. His discouraged fussy piety and gave pithy advice. 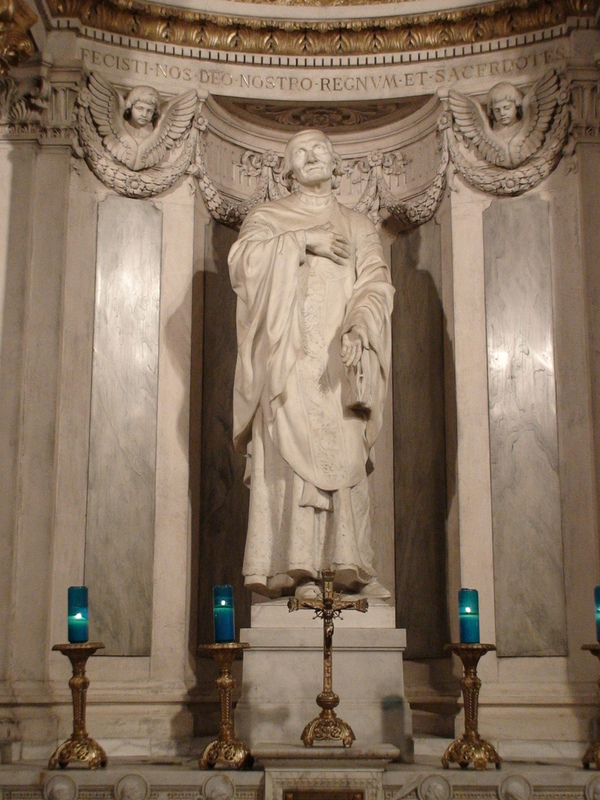 The archbishop of Auch said that Vianney had told him, "Love your clergy very much." And what more was necessary? It is remarkable to consider that this man had desired to become a Carthusian and live in quiet contemplation, yet in following God's plans for him, he drew many back to God and the Church. Three times he left Ars in search of solitude, but returned each time to aid the sinners who sought him in ever-increasing numbers. The last time required the diplomacy of the bishop to get him to return. In 1852, Bishop Chalandon of Belley made Vianney an honorary canon of the chapter. He was invested almost by force and never again wore the mozzetta. Indeed, he sold it for the 50 francs needed for some charitable purpose. The French government in 1855 made him a knight of the Legion of Honor. John Vianney was amazed. "Suppose I die," he mused, "and God says, 'Away you go. You have already been rewarded'." So he refused to have the medal even pinned on his old cassock. When the last sacraments were brought to him on his deathbed by Bishop Chalandon, John Vianney said, "How sad it is to receive holy communion for the last time." He died at 2:00 a.m. as a thunder storm shook the heavens; nature itself was upset at his passing (Attwater, Benedictines, Bentley, Delaney, Encyclopedia, Walsh). 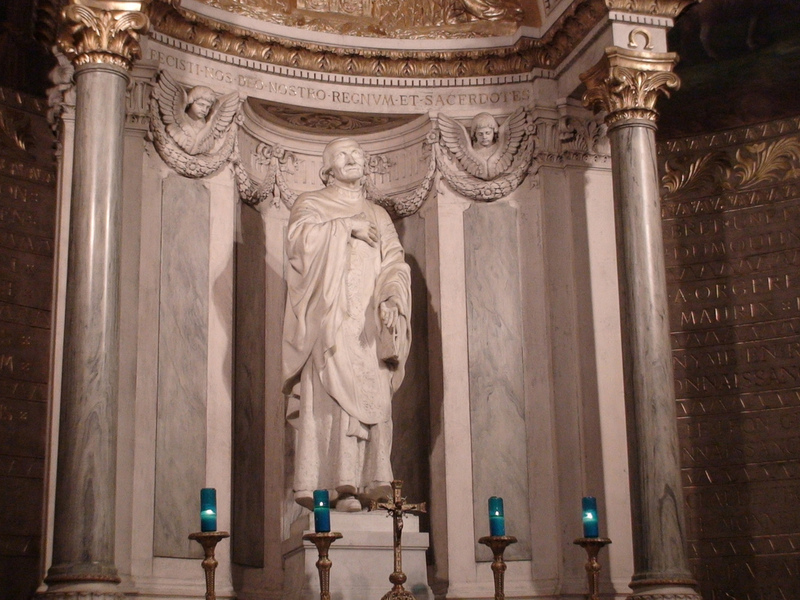 Statue of Saint John Vianney in the Shrine of Ars, France. "When we do nothing to be ashamed of, when everything is going along according to our wishes, we dare to believe that nothing could make us fall. We forget our own nothingness and our utter weakness. We make the most delightful protestations that we are ready to die rather than to allow ourselves to be conquered. We see a splendid example of this in Saint Peter, who told our Lord that although all others might be scandalized in Him, yet he would never deny Him. "Alas! To show him how man, left to himself, is nothing at all, God made use, not of kings or princes or weapons, but simply of the voice of a maidservant, who even appeared to speak to him in a very indifferent sort of way. A moment ago, he was ready to die for Him, and now Peter protests that he does not even know Him, that he does not know about whom they are speaking. To assure them even more vehemently that he does not know Him, he swears an oath about it. Dear Lord, what we are capable of when we are left to ourselves! "There are some who, in their own words, are envious of the saints who did great penances. They believe that they could do as well. When we read the lives of some of the martyrs, we would, we think, be ready to suffer all that they suffered for God; the moment is short-lived, we say, for an eternity of reward. But what does God do to teach us to know ourselves or, rather, to know that we are nothing? This is all He does: He allows the devil to come a little closer to us. Look at this Christian who a moment ago was quite envious of the hermit who lived solely on roots and herbs and who made the stern resolution to treat his body as harshly. Alas! A slight headache, a prick of a pin, makes him, as big and strong as he is, sorry for himself. He is very upset. He cries with pain. A moment ago he would have been willing to do all the penances of the anchorites--and the merest trifle makes him despair! "Look at this other one, who seems to want to give his whole life for God, whose ardor all the torments there are cannot damp. A tiny bit of scandal mongering . . . a word of calumny . . . even a slightly cold reception or a small injustice done to him . . . a kindness returned by ingratitude . . . immediately gives birth in him to feelings of hatred, of revenge, of dislike, to the point, often, of his never wishing to see his neighbor again or at least of treating him coldly with an air which shows very plainly what is going on in his heart. And how many times is this his waking thought, just as it was the thought that almost prevented him from sleeping? Alas, my dear brethren, we are poor stuff, and we should count very little upon our good resolutions!" "Whom does the devil pursue most? Perhaps you are thinking that it must be those who are tempted most; these would undoubtedly be the habitual drunkards, the scandalmongers, the immodest and shameless people who wallow in moral filth, and the miser, who hoards in all sorts of ways. No, my dear brethren, no, it is not these people. On the contrary, the devil despises them, or else he holds onto them, lest they not have a long enough time in which to do evil, because the longer they live, the more their bad example will drag souls into Hell. Indeed, if the devil had pursued this lewd and shameless old fellow too closely, he might have shortened the latter's life by fifteen or twenty years, and he would not then have destroyed the virginity of that young girl by plunging her into the unspeakable mire of his indecencies; he would not, again, have seduced that wife, nor would he have taught his evil lessons to that young man, who will perhaps continue to practice them until his death. If the devil had prompted this thief to rob on every occasion, he would long since have ended on the scaffold and so he would not have induced his neighbor to follow his example. If the devil had urged this drunkard to fill himself unceasingly with wine, he would long ago have perished in his debaucheries, instead of which, by living longer, he has made many others like himself. If the devil had taken away the life of this musician, of that dancehall owner, of this cabaret keeper, in some raid or scuffle, or on any other occasion, how many souls would there be who, without these people, would not be damned and who now will be) Saint Augustine teaches us that the devil does not bother these people very much; on the contrary, he despises them and spits upon them. "So, you will ask me, who then are the people most tempted? They are these, my friends; note them carefully. The people most tempted are those who are ready, with the grace of God, to sacrifice everything for the salvation of their poor souls, who renounce all those things which most people eagerly seek. It is not one devil only who tempts them, but millions seek to entrap them. "A little further on, as he entered the town, he saw a devil, sitting by himself beside the gate into the town, whose task was to tempt all of those who were inside. This saint asked his guardian angel why it was that in order to tempt this group of religious there had been so many thousands of devils while for a whole town there was but one--and that one sitting down. His good angel told him that the people of the town had not the same need of temptations, that they had enough bad in themselves, while the religious were doing good despite all the traps which the Devil could lay for them. "The first temptation, my dear brethren, which the devil tries on anyone who has begun to serve God better is in the matter of human respect. He will no longer dare to be seen around; he will hide himself from those with whom heretofore he had been mixing and pleasure seeking. If he should be told that he has changed a lot, he will be ashamed of it! What people are going to say about him is continually in his mind, to the extent that he no longer has enough courage to do good before other people. If the devil cannot get him back through human respect, he will induce an extraordinary fear to possess him that his confessions are not good, that his confessor does not understand him, that whatever he does will be all in vain, that he will be damned just the same, that he will achieve the same result in the end by letting everything slide as by continuing to fight, because the occasions of sin will prove too many for him. 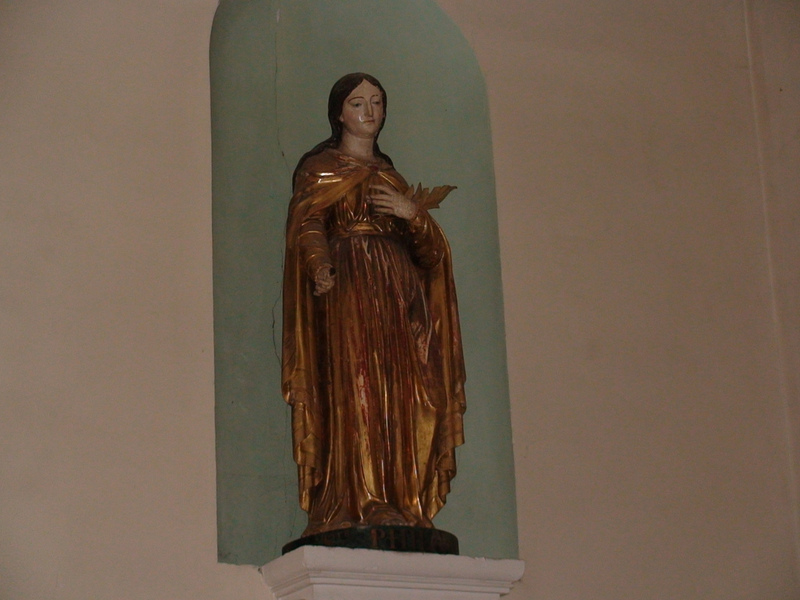 Statue of Saint Philomena in the Shrine of Ars, France. "These, my dear brethren, are the struggles to which God permits his great saints to be exposed. Alas, how we are to be pitied if we are not fiercely harried by the devil! According to all appearances, we are the friends of the devil: he lets us live in a false peace, he lulls us to sleep under the pretense that we have said some good prayers, given some alms, that we have done less harm than others. According to our standard, my dear brethren, if you were to ask, for instance, this pillar of the cabaret if the devil tempted him, he would answer quite simply that nothing was bothering him at all. Ask this young girl, this daughter of vanity, what her struggles are like, and she will tell you laughingly that she has none at all, that she does not even know what it is to be tempted. There you see, my dear brethren, the most terrifying temptation of all, which is not to be tempted. There you see the state of those whom the devil is preserving for Hell. If I dared, I would tell you that he takes good care not to tempt or torment such people about their past lives, lest their eyes be opened to their sins. "The greatest of all evils is not to be tempted because there are then grounds for believing that the devil looks upon us as his property and that he is only awaiting our deaths to drag us into Hell. Nothing could be easier to understand. Just consider the Christian who is trying, even in a small way, to save his soul. Everything around him inclines him to evil; he can hardly lift his eyes without being tempted, in spite of all his prayers and penances. And yet a hardened sinner, who for the past twenty years has been wallowing in sin, will tell you that he is not tempted! So much the worse, my friend, so much the worse! That is precisely what should make you tremble--that you do not know what temptations are. For to say that you are not tempted is like saying the devil no longer exists or that he has lost all his rage against Christian souls. 'If you have no temptations,' Saint Gregory tells us, 'it is because the devils are your friends, your leaders, and your shepherds. And by allowing you to pass your poor life tranquilly, to the end of your days, they will drag you down into the depths.' Saint Augustine tells us that the greatest temptation is not to have temptations because this means that one is a person who has been rejected, abandoned by God, and left entirely in the grip of one's own passions." 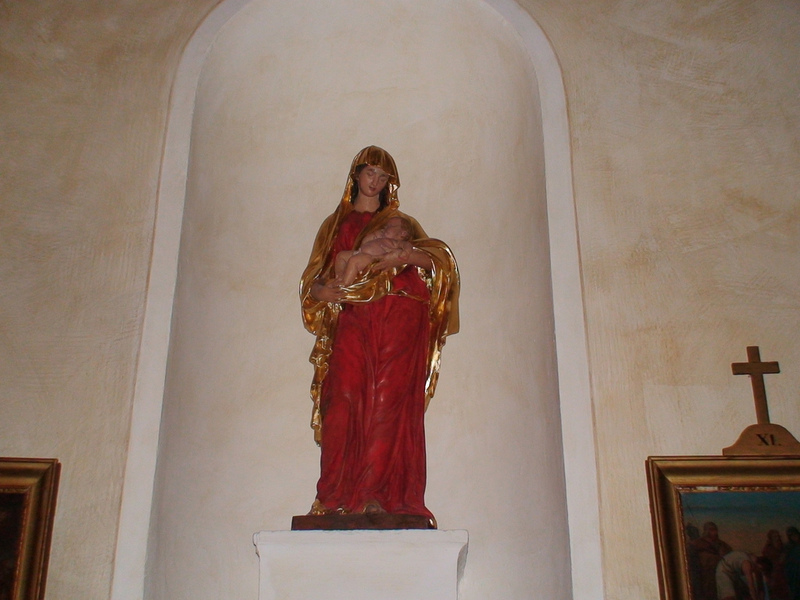 Statue of OUr Lady and Infant Lord in the Shrine of Ars, France.